The technical name for a hairball is a trichobezoar but no matter what you call it, rabbits can get them. Hairballs cause your rabbit to become obstructed, meaning food cannot pass through their gastrointestinal system. Since rabbits cannot vomit, hairballs will sit and grow inside your rabbit's stomach as they clean themselves and ingest hair and can potentially cause a blockage. Hairballs can be avoided by regularly brushing your rabbit, providing them with plenty of clean water in a bowl, and by giving them a proper diet and exercise. Some people even give their rabbits enzyme tablets or fresh papaya to aid in digestion and the breaking down of ingested hair. Surgery is a last resort to a rabbit that has become obstructed by a hairball. Mammary, uterine, and ovarian tumors are far too common in pet female rabbits and testicular cancer does not go unnoticed in male rabbits. Spaying and neutering pet rabbits is recommended for a variety of reasons and one of these reasons is to prevent reproductive cancers. If your rabbit is fixed their chances of developing mammary cancer is greatly diminished (and it's impossible for them to develop uterine, ovarian, and testicular cancers if these parts have been removed). 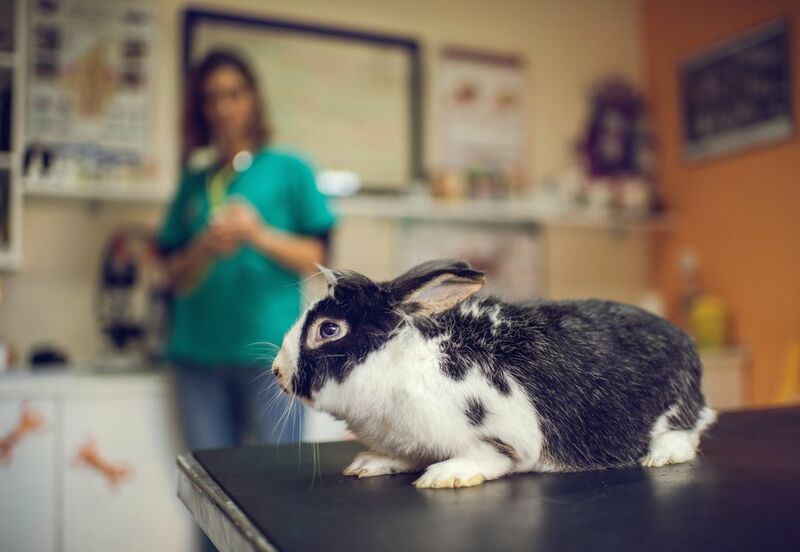 Discuss the risks associated with spaying and neutering your rabbit with your veterinarian as well as an appropriate age to have it performed. Rabbits are known for their large ears but these ears aren't always clean. Ear mites are small arachnids that feed off of the wax and oil that rabbit ears produce. They are irritating and cause your rabbit to itch, scratch and shake their heads. Secondary infections from ear mites also occur if the ear mites are left untreated and include bacterial and fungal infections. Large amounts of dark, crusty debris are usually seen in rabbit ears that have ear mites. Rabbits can get ear mites from direct contact with other rabbits, from being outside, and from our hands if we have recently handled an infected rabbit and then pet our own rabbit without washing. They are easy to avoid but also easy to treat. Diagnosis can be done by your veterinarian by visualizing them under a microscope but sometimes you can even see large groups of them moving with your naked eye. While dental disease often causes abscesses in rabbits, these pockets of pus are seen all over rabbits. They can be found internally on organs as well as in the skin layer of rabbits which makes them difficult to treat. The type of bacteria that is usually inside these abscesses is also a factor that increases the difficulty level of treatment since it doesn't need oxygen to survive. Antibiotics, cleaning out the abscess (if you can find it), and pain medications may all be prescribed for your rabbit by your veterinarian. Abscesses are serious and we don't always know why they occur but treatment is always needed as they do not go away on their own. Head tilts and seizures are chronic side effects of this protozoan that can secretly infect the majority of pet rabbits. Encephalitozoon cuniculi, often referred to as E. cuniculi, is a difficult disease that may or may not ever harm your rabbit. This protozoan can be transmitted to your rabbit through urine (and immune compromised humans) and live quietly inside your rabbit without ever hurting them. Or your rabbit may be compromised due to an illness, stress, etc. and this protozoan can then "awaken" and cause damage to internal organs and neural tissue causing seizures and a head tilt. Sometimes, with treatment, these issues go away and your rabbit returns back to normal, but other times we are left to manage a rabbit with a lifelong head tilt and/or seizures. Medications such as fenbendazole are usually prescribed to treat this terrible infection but the side effects of the neurological symptoms are what can be really life threatening to your rabbit. Ileus occurs when a rabbit stops eating and when their world is spinning they don't want to eat. Other medications to combat ileus along with syringe feeding and fluid administration may be necessary as well. Ileus is also known as GI stasis because it occurs when the normal peristalsis of the intestines stops. Food doesn't get moved through your rabbit with ileus so gas is formed and your rabbit doesn't want to eat and stops defecating. This is a life-threatening problem and needs immediate attention as rabbits cannot live for more than 48-72 hours with ileus left untreated. Syringe feeding green vegetable baby food and water must be immediately done and a visit to your veterinarian must be made for medications and potential fluid administration. Also seen in pet rats, bumblefoot is a common problem in obese rabbits, rabbits that don't exercise, rabbits that have a rough surface to sit and walk on, and rabbits who like to sit in their dirty litter boxes or bedding. It is technically referred to as pododermatitis and requires antibiotics, pain medications, a new cleaning plan for the cage, and often times dietary plans and bandaging to correct. It is very painful and your rabbit may limp or not want to walk if they have bumblefoot.